My name is Arnaud Germain. Originally from France, a French teacher by profession, I started my career in England, near Leicester before moving to Malawi where I spent 6 years, from 2004 to 2010, before returning for one year to the UK. After teaching for two years in Nakuru, Kenya, and 4 in Alexandria, Egypt, I have now moved to Morogoro, Tanzania where I teach in an International School. As far as I can remember, wild animals have always fascinated me, and when I was about 10, my ambition was to go on a photo safari to Kenya. I had to wait 18 more years before fulfilling my dream. I started photography when I was at university as I learnt to take pictures underwater, as part of the activities my diving club was offering. You can see the legacy of this in my underwater section, especially my interest for sharks. Taking pictures underwater is not the easiest way to learn photography and the first pictures were very disappointing but I kept at it. Before long, I had good pictures from the Mediterranean and the Red Sea. In 2001, I bought a Nikon F60 camera and two lenses. Since then I have upgraded my gear slowly but surely, going for the Nikon D70, then the D200, which I still use, and now the D700, which I love. I use 6 lenses, a 12-24 mm Sigma lens, an 18-105mm Nikon VR lens, a 70-300mm Nikon VR lens, a 28-105 Nikon Macro lens, an 85mm Nikon macro VR lens and a 150-500mm Sigma OS lens. All these lenses were upgraded over the years. One of my most important piece of equipment is my monopod, which can be used as a walking stick, something to move the vegetation and, sometimes, stabilise a camera. I started wildlife photography going to different zoos around the UK. I also attended three workshops by Wild Arena, gaining access behind the scenes. Moving to Malawi was a huge step as I was very close to all the wildlife I had been dreaming about. Over the years, my pictures have been used in different media. I have contributed to the Wildlife and Environmental Society of Malawi(WESM) Calendar since 2006, the Department of National Parks and Wildlife (DNPW) have used some of my pictures in their 2010 and 2011 calendars. The Malawi Ministry of Tourism has used some pictures for their brochure published in 2009. Land and Lake Safaris have used my pictures on their websites, postcards and brochures. 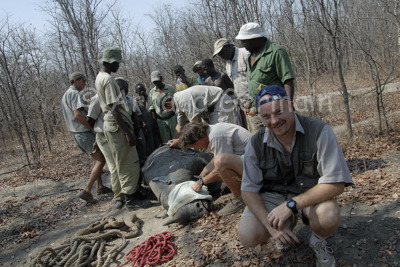 I was asked in 2008, to contribute to a book about Liwonde National Park and supplied the author with about 40 pictures. The book was published by Central Africana, with whom I have worked ever since. Finally, I have taken pictures for the Lilongwe Wildlife Centre. This structure tries to care for injured or orphaned animals and, whenever possible, tries to release them back in the wild. In 2008, Kelloggs and the Born Free Foundation came onboard for a campaign in the UK to make people adopt monkeys at the Centre in order to raise funds. I took the pictures for the whole campaign and they were on more than 60 millions packets of cereals in the UK. In 2009, the same campaign started in Italy and I was doing the pictures for this one too. In 2011, two of my pictures were published in different newspapers, including the Times in the UK and in several countries around the world, thanks to Catersnews Agency in Birmingham. Sharing my passion for the wild has always been important. I am very lucky to have a wife who shares this passion and two young children who have already been on many safaris. Whilst teaching in Malawi, I started a Wildlife and Photography club at school. The students' response was very positive and the conclusion of a term's hard work was always a trip to a National Park. Over the years, I have lead many trips and the most rewarding development is that a few students have become excellent photographers and are continuing taking pictures. I also have to mention Jan and Peter Todd and Emma and David Barber for sharing many of my adventures in Malawi (like getting stuck in different places) and Hayley Davidson in Kenya (for her love of getting charged by different animals). Finally, I would like to say that a lot of the pictures I took in Africa were made possible thanks to a few remarquable individuals: Lee Stewart at the Wildlife Centre, Lilongwe, Mark Sprong, at Land and Lake Safaris and Chris and Pam Badger, at Wilderness Safaris, both in Malawi. But the people who really allowed me to express myself were the guides who first taught me a lot about the bush and put me in the best conditions possible to take the shots. I have been with many and they should all be thanked but three stand out: McLoud and Angel in Liwonde National Park and Andrew Bwalya in South Luangwa National Park.